During late January 2001 a circular feature lined with flint was observed to the left (north) of the entrance to Stones Orchard in Croxley Green. It seems likely that the fill of this has been disturbed by the high rainfall of last autumn and that ground subsidence has occurred as a result. The feature was approximately 1.1 meters in diameter and when first seen by archaeologists, on the morning of 3 February, the depression was around 70 centimeters deep. First impressions were that the feature was a water well or perhaps a soak-away for buildings. The lining was of worked flint nodules, similar in style to those used to rusticate buildings in the locality and there was some evidence that part of this lining on the north side had collapsed (see below). Whatever the function of the feature it was obvious that it had been deliberately filled in and that this action had taken place in the relatively recent past. The depression was excavated to a depth of approximately 1.2 meters but showed no signs of an earlier layer of fill beneath which would have given us an earlier infill date. The fill itself was of dark humus rich material containing large quantities of ceramic building material (CBM) as well as modern litter such as confectionary wrappers and ring pull cans (most of these went out of production in the UK in the late1980’s). It seems likely therefore that the latest infilling of this feature probably took place as recently as 20 years ago or less. The CBM in the fill was similar to large quantities of material found extensively nearby. It seems likely that this material comes from the destruction of farm buildings that once lay on the site and are shown on a map of Croxley Green dated 1839. This material has subsequently been re-deposited in the feature during attempts to fill it in – probably for safety reasons. It is possible that the local authority may have a record of having filled this feature in, as they would have been responsible for public safety on the site. As well as brick there was a considerable amount of peg tile amongst the CBM; this was unusual in that the peg holes were square suggesting that they may have been made by machine. This would imply that the buildings are quite late, perhaps late 18th or early 19th century in construction. It was not possible to extend the excavation downwards as the size of the aperture and the depth of the excavation made further work both difficult and potentially dangerous. I am including a number of illustrations of the feature taken at the time as well as a plan that I made from memory, and from the digital imagery, after the dig. Measurements were taken at the time, as was the compass reading. Despite the exploratory excavation of the feature interpretation is still somewhat problematic as it was not possible to locate the earliest fill of the feature, which would have given us a clue as to when it was first filled in, though not when it was dug. My own feeling is that it may eventually prove to be a soak-away rather than a well. Although the straight sides are well like in construction it is possible that they widen out with depth to give a bell shaped soak-away profile similar to those found in other local buildings dating from the 18th & 19th centuries. 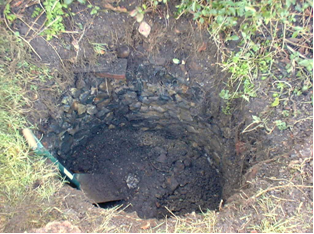 Indeed filling in a soak-away often leads to subsidence as it almost impossible to fill in the bell shape from above and the cone of material filling the soak-away continues to slump for many years afterwards. 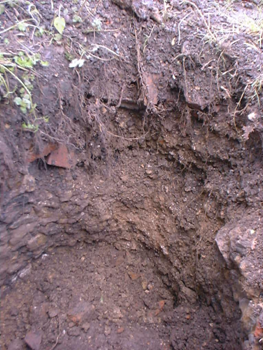 Soils used as fills can also be washed / dissolved from soak-aways by a process known as sapping – especially during periods of prolonged and heavy rainfall. 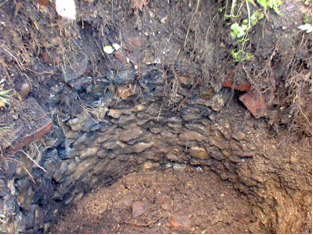 The absence of part of the flint lining in the northeast section of the feature’s wall, which may represent no more than a localized collapse, could point to its use as a soak-away as this may represent the entry point for a culvert bringing rainwater and farm wastes from the roofs and floors of the stables and cowsheds that lay just a few meters north of the feature. It will take further excavation of the site to reveal the true function of the feature. This would most likely require a couple of days work by two archaeologists and there would be a requirement to assess the danger of digging the feature beyond 1.2 meters depth. Shoring would most certainly be required and there is no guarantee that it would be possible to dig down to the feature’s base if it turns out to be a deep well. 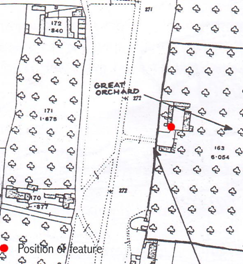 Taking a broader view of the archaeology at Stones Orchard it should be acknowledged that there is every possibility that much more could be learned about the farm buildings on the site if a wider excavation of these were to be undertaken. As the site is not on the County SMR (Sites and Monuments Record) local historical societies / archaeology groups would only require the permission of the landowner to carry out an investigation of the site. 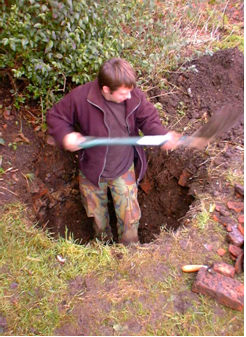 With a number of competent local groups already existing in the area it would be relatively easy to staff such an excavation and qualified archaeologists might well be willing to supervise such work at weekends on a voluntary basis. It should also be noted that while the farm buildings may be relatively late in date there is every possibility that they overlie earlier buildings of Tudor, Medieval or earlier date. Recent excavations locally at sites such as ‘The Grove’ have proved that the area has been inhabited since early in the Mesolithic Age. M CRAIK. Reviewing the above (written at the time) and after consultation with experienced archaeologists, the feasibility of excavating the well to base, given the totally destructive nature of the work and the Health and Safety risk for the diggers is problematic: the hire of a powered auger (quite costly) would seem more appropriate, bearing in mind that the ‘fill’ might well include ancient timbers now rotted down, and a Geophysical survey of the surrounding area could prove more rewarding.